This article is about the character that resembles a metallic version of Mario. For the metal form that Mario can transform into, see Metal Mario (form). For the power-up regarding this form, see Metal Cap. Metal Mario is a character in the Mario universe, usually being one of the fiercer end-game opponents in the Mario sport games or Super Smash Bros. series. He is a spin-off from Metal Mario, which is a form of Mario. Metal Mario often plays the role of Mario's rival, suggested by his roles in Super Smash Bros. and various bios. This is also implied in the Mario Kart games, where he says "Mia mama" as opposed to Mario's "Mama mia" and "Papa" instead of "Mama". Metal Mario retains many traits from the power-up variant, such as being very slow and not very agile, but being a very powerful character; many games he is playable in has the stats of larger, more powerful characters such as in Mario Kart and various Mario sports titles. Metal Mario retains much of Mario's voice clips, voiced by Charles Martinet, and he appears voiceless in the Super Smash Bros. series, though Mario Kart 7 is the first installment where Metal Mario has his distinct set of voice clips with a filter applied over them. While Metal Mario in Mario Tennis Open and Mario Sports Superstars recycles voice clips from Mario, the aforementioned filter is still applied over those voices to distinguish him from Mario. Metal Mario in Super Smash Bros. 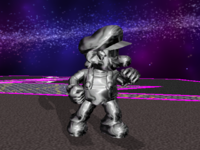 In Super Smash Bros., Metal Mario makes his debut as a mid-boss encountered in Stage 9 out of 10 stages. He has his own stage, which is playable only in the one player mode of the game. Unlike the power-up he is based on from Super Mario 64, other characters can attack and rack up damage on him. To mirror his role in Super Mario 64, he is a far more durable character than the regular Mario; in fact he is the heaviest and most resistant character in the game. When his damage percent is low, weaker attacks cannot flinch him, and attacks start flinching him only at far higher percentages. Due to his high weight, however, he has trouble recovering when he is knocked off the stage. Additionally, Metal Mario does not dash; he mostly walks around, patrolling the stage. On a side note, Kirby is unable to copy Metal Mario's powers, which is later possible to do in Super Smash Bros. Melee. Metal Mario returns as a mid-boss in Super Smash Bros. Melee's Adventure Mode, being fought on Battlefield. In this game, Metal Mario fights alone by default, but if the player unlocks Luigi, Metal Luigi joins the fray as well. They both retain their strengths from Super Smash Bros.; Metal Mario and Metal Luigi are very heavy opponents who are tough to knock down the stage, but cannot recover once they are knocked down. Additionally, players can pick up the Metal Box item, turning into metal forms, boasting the same attributes as Metal Mario and Metal Luigi, though the power-up is not permanent, unlike Metal Mario and Metal Luigi. KOing Metal Mario and Metal Luigi in Adventure Mode awards the player the "Metal Bros. KO" bonus, worth 8000 points. He also appears as one of the many collectable trophies in the game. Yoshi's Island, a stage in the game, is reflected on the texture of Metal Mario's model. Metal Mario has not appeared in the later Super Smash Bros. games as an individual, being replaced by metal battles in Classic Mode, where players face a metallic form of any character rather than only Mario. In Super Smash Bros. Ultimate, Metal Mario appears as the final boss in Bowser's classic mode route, appearing after Mario is defeated in a similar manner to Giga Bowser in Mario's route and in Super Smash Bros. Melee. He also appears as an Ace-class Shield-type primary spirit, using his artwork from Mario Kart 7. Equipping it will increase a fighter's weight during battle. In the spirit's battle, the player faces a metallic Mario on the Battlefield form of The Great Cave Offensive. Metal Mario's core can be combined with the cores of a Super Mushroom and a Fire Flower to summon the Gold Mario spirit. 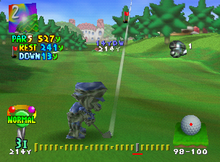 Metal Mario is an unlockable playable character in Mario Golf for the Nintendo 64. He is unlocked when players collect all 108 Birdie Badges. He boasts the strongest drives from his set of clubs, meaning he can hit the ball the furthest out of any character in the game, though his sweet spot and control come at a cost. Metal Mario's ball trajectory is a strong draw, meaning that the ball has a strong curve to the right. If Metal Mario scores a Nice Shot while using a power shot, the ball goes into flames, which is shared with the other Mario characters, namely Mario and Baby Mario. Metal Mario shares the exact voice clips as Mario. In Japanese versions of the game, Metal Mario is absent. Although Metal Mario does not make an appearance in Mario Golf for the Game Boy Color, he is mentioned on the Score Card. Metal Mario returns as the final boss of Wario's storyline in Dr. Mario 64, where he appears as a metal version of Dr. Mario. In this game, Dr. Mario turns into Metal Mario when he accidentally eats some Megavitamins. He can be unlocked as a playable character when the Story Mode is beaten with Wario without losing once. 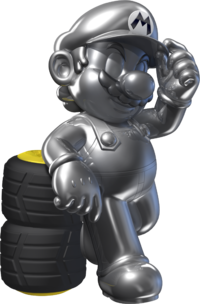 After a ten year absence from appearing as an individual character, Metal Mario makes a return as an unlockable playable character in Mario Kart 7, where he is unlocked by winning the 150cc Special Cup. He is one of four drivers to enter the Mario Kart series for the first time (the other three being Lakitu, Wiggler, and Honey Queen). He is a Heavy class character (alongside Bowser, Wario, and Honey Queen), with an advantage bonus of weight and some speed. Because he ranks among the Heavy class, Metal Mario is the fastest and heaviest character in the game, but he has the lowest acceleration and handling stats. Additionally, Metal Mario's karts have the same body frame size as that of the Medium class characters, which makes him a smaller target than the other Heavy and Cruiser characters. His signature emblem is a shiny, metal version of Mario's M logo. Bowser, Rosalina, or Mario always appear as rivals when he is picked. Additionally, Metal Mario has his own set of voice clips from Mario, and Mario Kart 7 is the first game in the Mario series where Metal Mario is given a filter to differentiate his voice from Mario's voice. Metal Mario appears as the Normal and Expert Staff Ghost for Neo Bowser City and DS Airship Fortress. Metal Mario appears as a returning racer in Mario Kart 8, and he is an unlockable character. Additionally, there is another character related to Metal Mario named Pink Gold Peach (who is classified in the same weight subdivision as Metal Mario). Like in Mario Kart 7, Metal Mario is classified as a Heavy character, where he has high speed and weight, but lower handling, traction, and acceleration, but within this category, he is tied with Bowser, Wario, Morton, the large Miis, and Dry Bowser in the acceleration, weight, and traction department. However, his speed and handling are tied with that of Rosalina, Donkey Kong, Waluigi, Roy, and Link. Also much like in Mario Kart 7, Metal Mario's (as well as Pink Gold Peach's) vehicles use the same body frame size as the Medium class characters, making him a smaller and slightly harder target to hit. His kart emblem is a gray version of Mario's signature "M" symbol with a light gray outline. Metal Mario appears as the Staff Ghost, used by Nin★Leonel for N64 Rainbow Road. This combo uses the Standard ATV, Monster tires, and Super Glider. Metal Mario appears in Mario Kart Arcade GP DX, an arcade entry of the Mario Kart series. Just like previous Mario Kart games, he is a heavyweight, with high speed, but below average acceleration and handling. His kart is the Metal Spark. Metal Mario also has an alternate costume, Gold Mario, which not only changes Metal Mario's color scheme, but adds pupils to his eyes as well. As with every character playable in Mario Kart 8, Metal Mario returns as a playable character in Mario Kart 8 Deluxe for the Nintendo Switch, this time being available from the start. Similarly to Mario Kart Arcade GP DX, Metal Mario has a Gold Mario variant, which can be unlocked by winning every 200cc Grand Prix cup. Although Metal Mario's statistics have been slightly altered when compared to the original Mario Kart 8, he is still classified in the same weight subdivision as Pink Gold Peach, and is still a heavy character. 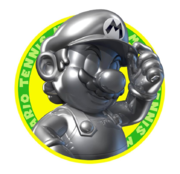 Metal Mario returns in Mario Tennis Open as the final QR Downloadable Character, being the only QR character that is not a Yoshi. His type in this game is Power, and, as in Mario Kart 7, his voice is a warbled variation of Mario's voice, although he has the same voice set as Mario otherwise. He is the strongest character in the game with the fastest serves, and his shots travel very quickly through the court. Due to his power and weight, he returns Chance Shots with little effect on him (if he returns them correctly), and his Chance Shots themselves have a longer-lasting effect on his opponents. He is one of the slowest characters in the game, however, and unlike Bowser, another slow character, he has below-average reach and a poor lunge, which makes it difficult for him to predict shots and reach up to them. Metal Mario's racket costs 1750 coins to buy at the Clubhouse for Miis to be able to use, where his racket can be paired with other Mario-themed costumes to get a boost in stats. If Mario scores a Double Bogey or worse in golf, a Green Shell hits him and he reverts to Small Mario. If Metal Mario receives one, he is buried by many Green Shells and Red Shells, although he retains his form. In baseball and soccer, Mario's special shots surround the ball in red fire. Metal Mario's special shots surround the ball in gray flames. "Mario's very heavy rival has joined the roster to wreak havoc on the road. He really shines in the Grand Prix." "Just as heavy as his shiny steel appearance suggests, and his top speed is very impressive indeed." Guide: "You'll find larger racers on the track, but you won't find anyone tougher. Metal Mario is another true heavyweight, which means he's traded handling and acceleration for high speed and a powerful jostle." Biography: "As heavy as Wario, but not quite as fast, Metal Mario does enjoy some better handling in exchange for losing that speed." Mario Kart 8 - Metal Mario saying his name. Mario Kart 8 - Metal Mario saying, "Bravissimo!" Mario Kart 8 - Metal Mario saying, "Oh, Papà!" Mario Kart 8 - Metal Mario saying, "Oh, Mia Mamma!" Mario Kart 8 - Metal Mario saying, "Hee hee, I got it!" For this subject's image gallery, see Gallery:Metal Mario (character). This page was last edited on April 13, 2019, at 16:14.